Really good question isn’t it. Particularly as we spend almost a third of our lives in bed, sleeping. 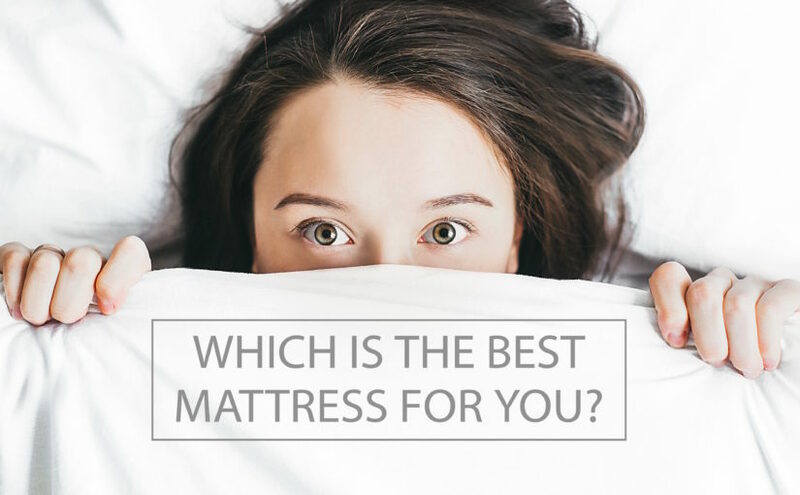 So how do you really find out which is the best mattress for you? Well, unfortunately the answer isn’t quite as simple as you hoped. Because there isn’t a best mattress, but there is a best mattress for you. And that ‘for you‘ is the most important part. Have you ever been mattress shopping before? It’s tedious, stressful and well pretty darn awkward. Testing a mattress in a showroom with lots of people staring at you isn’t exactly glamorous. And you usually have a salesperson hovering in the corner ready to pounce. You tend to get onto the mattress, shoes, coat, hat and scarf included and lie like a pencil for 10 seconds. Which is absolutely not how you would usually sleep at home! But the key to finding the best one for you, is to stick the testing out. Test, test and test some more. And try to pretend that no one is watching whilst you do. Our advice – visit at awkward times when the shop will be less busy. And don’t feel wrong for telling the salesperson to give you 30 minutes alone. You can go and find them when you are ready for help. So what defines the best mattress? Well the most expensive mattress is certainly NOT the best. Price means nothing when it comes to choosing the right mattress for you. Everybody always believes that money buys you luxury, and it does most of the time. But not with mattresses. Just because it’s the most expensive doesn’t mean it’s right for you. The price simply determines the cost of the materials used to make it. Eg. The more pocket springs, the more expensive. Not necessarily any better. How will I know if the mattress is right for me? You just will. When customers visit our showroom to test our mattresses, we tell them ABSOLUTELY NOTHING about them until after they have tested them. And by tested, we mean rolled around a bit, and spent a good 10 minutes on each one. That is because you will then make a decision as to which mattresses you actually like, without being influenced by anything else. It always happens that you will gravitate towards a particular type. Whether that be all pocket sprung mattresses, all the ‘firm’ mattresses or perhaps even none of them at all. It’s ok to not like any of them. Move on to the next shop and start the process again. If I have back problems, which mattress should I choose? Again, the right one for you. There are studies to say that firm mattresses help people with back problems. However, I have a lower back injury and I hate firm mattresses. So even though the study says it’s better for me, if I don’t like firm mattresses, how am I going to get a good nights sleep? The best mattress for me was our Duo 1200 – a combination of 1200 springs with an inbuilt memory foam topper. (There is also a study to say bad backs are helped by memory foam too by the way). It’s actually the cheapest and softest mattress in the Furl range, but the one I found the most comfortable. And it’s absolutely the best mattress I’ve ever had…for me. It’s best that you don’t know what the rating of a mattress is until after you have tested it. As we will all make up our own minds as to which one of the three ratings we think it is. I so often speak to people that think our softest mattress is our firmest. And that our firmest is one of the softer ones. Firmness ratings are only a guide. We all feel things differently. So you decide your own ratings and then choose the one you like the most. So the best mattress for you, is the one that you feel to be the most comfortable. You will have to invest your time in testing them out. But when you’ve found the right one, you will wish that you’d done it all sooner.